Gold Star families are speaking out after President Donald Trump said his predecessor, former President Barack Obama, did not call the families of fallen soldiers. A number of Gold Star families who lost their children or spouses in the military during Trump's term in office said the president has yet to call them. One Gold Star parent said Trump promised him a $25,000 check, only for it not to come. The White House said the check has been sent. Gold Star families are speaking out after President Donald Trump accused former President Barack Obama of not calling the families of fallen soldiers. As The Washington Post and Associated Press have found in extensive reports on Trump's calls to Gold Star families since taking office, a number of parents and spouses say they have yet to receive calls from the commander-in-chief. And one parent who did receive a call from Trump said the president promised him a $25,000 check, which he had not yet received. The White House later said the check "has been sent." The AP reached out to the families of all 43 military servicemembers who have died on duty during the Trump presidency, making contact with roughly half the families. Of the families that would discuss their contact with Trump after the death of their child or spouse, nine said they had heard from Trump either in a phone call or letter, while nine others said they had not. The biggest revelation came from Chris Baldridge, whose son, Army Sgt. Dillon Baldridge, was killed in June in Afghanistan. Baldridge told The Post that Trump offered him a $25,000 check and offered to help establish an online fundraiser for the family in his phone call following the death, but the president apparently did not follow through. "I could not believe he was saying that, and I wish I had it recorded because the man did say this," Baldridge said. "He said, 'No other president has ever done something like this,' but he said, 'I'm going to do it.'" In a statement following The Post story, White House spokeswoman Lindsay Walters told the publication that the check had been sent. "It's disgusting that the media is taking something that should be recognized as a generous and sincere gesture, made privately by the president, and using it to advance the media's biased agenda," she said. CNN subsequently reported that Trump sent the check on Wednesday, when The Post's story was published. Among the people who spoke up about not having received a phone call from the president was Mark Hunter, whose son, Army Sgt. Jonathon M. Hunter, died in a suicide bombing attack in Afghanistan in August. Hunter told the AP that he was told to expect a call from Trump, but that it did not happen. "Disappointed that he at least didn't call and thank me for my son and our ultimate sacrifice," he said. "That's all I wanted to hear. He didn't have to say nothing else. That's all I wanted to hear. From him — not the vice president." The family spoke with Vice President Mike Pence. Though, as the AP reported, calling every family of a fallen soldier is not a tradition, and past presidents have not called each Gold Star family. 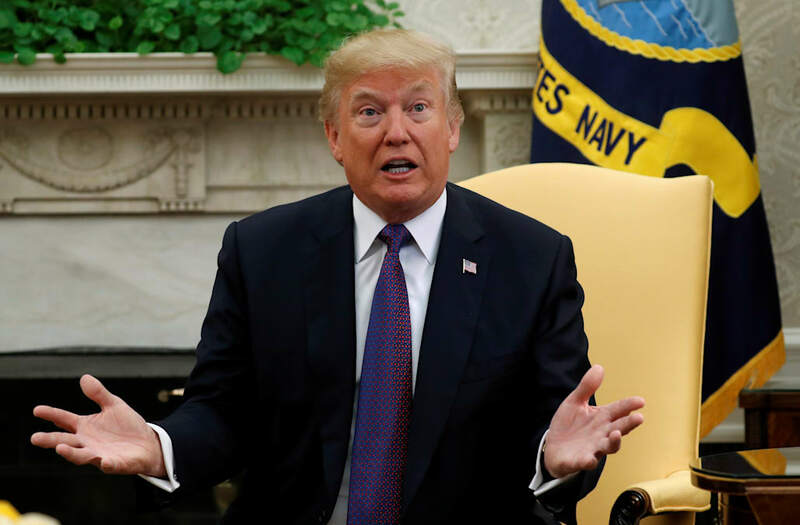 Trump brought the issue to the limelight earlier this week when, at a Monday press conference, he said former President Barack Obama and fellow predecessors did not call the families of soldiers killed in the line of duty. Trump made the comment when asked why he had not publicly mentioned the soldiers killed in the Niger ambush earlier this month. It was a false claim that was met with scorn from former Obama administration aides, and Trump backed off the claim slightly when pressed further by reporters. "I think I've called every family of someone who's died," Trump said, adding, "virtually everybody." After the initial backlash to his comments, Trump also told Fox News Radio host Brian Kilmeade on Tuesday to ask his chief of staff, John Kelly, whether Obama called him when his son Robert was killed in Afghanistan in 2010. The episode intensified after Rep. Frederica Wilson of Florida told the Miami ABC affiliate WPLG on Tuesday that Trump had told Myeshia Johnson — the widow of Sgt. La David Johnson, one of the four troops killed during a mission in Niger — that, "He knew what he signed up for, but when it happens, it hurts anyway." "So insensitive," Wilson told WPLG. "He should not have said that — he shouldn't have said it." Wilson, who mentored Sgt. Johnson, said she was riding in the car with Myeshia, who was on her way to the airport to receive her husband's body, when Trump called. The phone was on speaker. Wilson then told MSNBC on Wednesday morning that the soldier's widow was "crying the whole time" and that when she hung up the phone, she looked at Wilson and said, "He didn't even remember his name." That led Trump on Wednesday to say he had proof she "fabricated" her account of the call. Speaking to the press during a White House meeting with the Senate Finance Committee on Wednesday, Trump again pushed back on Wilson's account of what he said. "Didn't say it at all," he said. "She knows it. And she now is not saying it. I did not say what she said and I'd like her to make the statement again because I did not say what she said. I had a very nice conversation with the woman, with the wife, who sounded like a lovely woman. Did not say what the congresswoman said, and most people aren't too surprised to hear that." 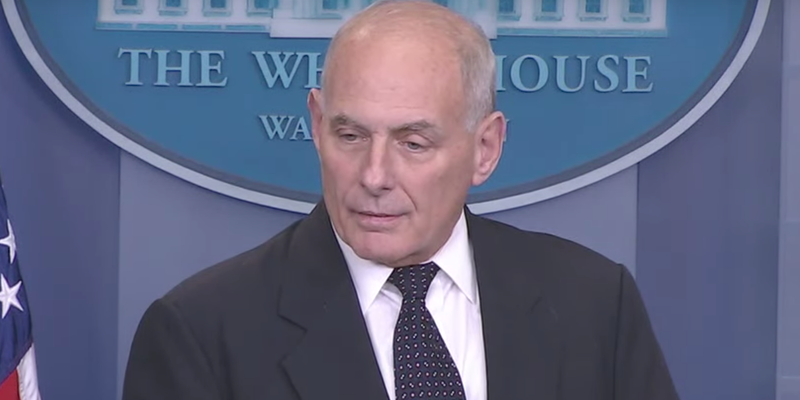 Kelly later blasted Wilson during Thursday's press briefing for telling the press about the details of Trump's call, calling her an "empty barrel" whose "selfish behavior" stunned him and adding that the message Trump was sending to Sgt. Johnson's was that he was where he wanted to be when he life was taken from him. "That was the message," Kelly said. "That was the message that was transmitted. It stuns me that a member of Congress would have listened in to that conversation. Absolutely stuns me. And I thought at least that was sacred." Sgt. Johnson's own mother told The Post via Facebook Messenger on Wednesday that Wilson's account of the conversation was accurate. "President Trump did disrespect my son and my daughter and also me and my husband," Cowanda Jones-Johnson told The Post. Though she declined to elaborate, she said "yes" when asked whether Wilson's account was true, The Post reported. Other Gold Star family members spoke to various media outlets as this episode continued to unfold. On CNN Thursday morning, Shelia Murphy, mother of fallen soldier Etienne Murphy, who was killed in Syria in a rollover incident in May, said she had not received a call from Trump. "But it's OK," she said. "It doesn't matter if I hear from the White House. It's not really about that. I just want people to remember my son." "I just want him to not forget my son," she added. "I thanked President Trump for ordering the air strike in Syria. It just wasn't enough to save my child. I have no hard feelings toward anyone." Ryan Cross, a veteran of Afghanistan whose brother, Benjamin Cross, was one of three US servicemembers killed when a military plane crashed off the coast of Australia earlier this year, said he felt sick that Trump was "using fallen service members to score political points." "Especially when his claims of reaching out to every Gold Star family are completely false,” Cross told The Portland Press Herald in a text message Thursday. "Personally, I'd rather not hear from him given that I don't believe he has any clue as to what service and sacrifice really mean, nor does he understand the gravity of what we as members of the armed forces, veterans and their families risk and have risked," he added.